Use the hashtag #BucksBrexit on the day of the Brexit Summit to join the conversation on social media. Buckinghamshire Business First will be working in partnership with key stakeholders in business and government to ensure that Buckinghamshire is the best place to do business, no matter which Brexit scenario greets us in 2019. Our 'Brexit in Buckinghamshire' homepage is a great source of information and advice related to Brexit, including the latest announcements from the government regarding preparations for a no deal scenario. As well as using #BucksBrexit, you can also use #BucksBusinessFest to show you are a part of the Festival. Parking - Please park in the overflow parking facilities that have been provided for this event at Ford Meadow Car Park. A map is attached to direct you to the venue, which is a short walk away. Alternativley you can park in the Innov8 car park, a map can be found here. There will also be assistance on hand to guide you. Refreshments - A light buffet lunch will be provided. 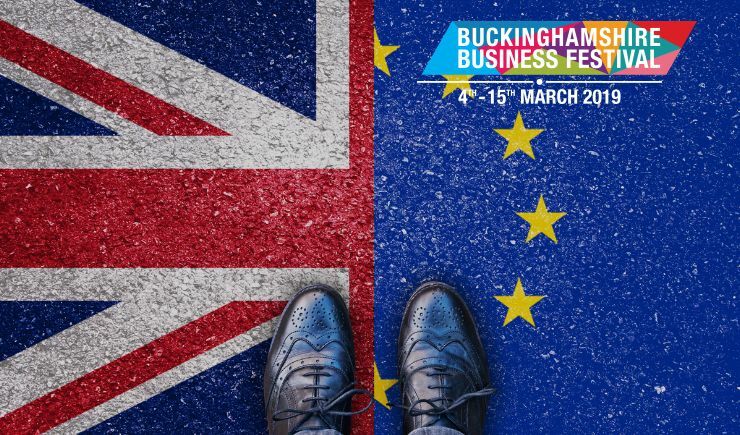 Get connected - This event is part of the the Buckinghamshire Business Festival, use #BucksBrexit and #BucksBusinessFest on social media in the build-up and when attending this event to promote your involvement in the Buckinghamshire Business Festival. Allie devises recommendations and represents the voice of members on EU reform matters and helps provide the link between business and Government on international trade. She provides advocacy on a range of EU regulatory issues. Martin has been Leader of Buckinghamshire County Council since May 2011, having joined the Council in 2005. His responsibilities include overall policy direction and strategy, financial strategy, communications, external relations with Government and representative bodies. HS2 is a particular concern for Martin and he leads the county stance on this as well as economic development. Prior to becoming Leader Martin was Cabinet Member for Planning and Environment. He has pursued a policy of making Buckinghamshire “Member Led” and has introduced a “Think Councillor” policy for all officers. Martin is now the Chairman of the LGA Environment, Economy, Housing and Transport Board. He is also Chairman of SESL (South East Strategic Leaders) and England’s Economic Heartland Strategic Alliance. Martin has a background in management consultancy and in marketing. He has been a member of a Hospital Trust Board and a member of the Governing Body of a school in one of the county’s most deprived areas. Neil has championed major infrastructure projects, chaired the Project Executive for East West Rail, and developed ‘England’s Economic Heartland’, a strategic alliance across Buckinghamshire, Oxfordshire and Northamptonshire to drive economic growth and investment. Neil is a Non-Executive Director of Bucks Advantage, a development company co-owned by the Buckinghamshire Authorities and the private sector. From leaving Ireland at the age of 17 to becoming Managing Director of Buckinghamshire Business First, Philippa has steadily worked towards a role that suits her down to the ground. An accountant by profession, with more than 30 years’ experience of working within varied accounting environments in both the public and private sector, Philippa became Managing Director of Buckinghamshire Business First in April 2012. She is highly motivated to make the right things happen for customers, staff and stakeholders by listening to them, seeing the whole picture and joining up the dots at strategic and operational levels to achieve results. A great believer in openness, transparency and honesty, with a collaborative style, she has led BBF through a period of radical change in the economic landscape. She has valuable experience in managing complex funding streams and multi funded revenue and capital projects that require the ability to work across different sectors with varying reporting needs. Philippa’s appointment at BBF brought together her passions for business and her love of Buckinghamshire. Since arriving from Ireland she has lived, worked and brought up her family in the county. Experts in business, offering members business services, including advice, financial expertise, support and a powerful voice in government.